Level 3: Lessons 1-25. 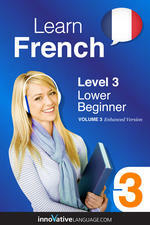 Lower Beginner French lessons get you speaking French with fun and easy lessons. Level 8: Lessons 1-25. Learn Upper Intermediate French with these fun, effective lessons! Explore 60 scenarios and learn over 1,250 practical French vocabulary words with this powerful e-book dictionary. Explore 26 scenarios and learn over 550 practical French vocabulary words with this powerful e-book dictionary. Friendly start to French made just for kids. Learn 274 practical words through colorful scenarios.